Avid Travel operates tours and transfers for many different groups. Social groups can charter our coaches for functions and events. For our personal travelers, we have a program that allows you to pay for your travel in easy to pay installments. For the budget conscious traveler, we have available our "LAY-BY" option. Your tours can be paid in installments. So not only do you get great value tours, but you also have the freedom to book now, pay later. Business conference organisers can get a complete package for all their logistics needs at one place. We have a wide range of tour itineraries for single days or extended tours. 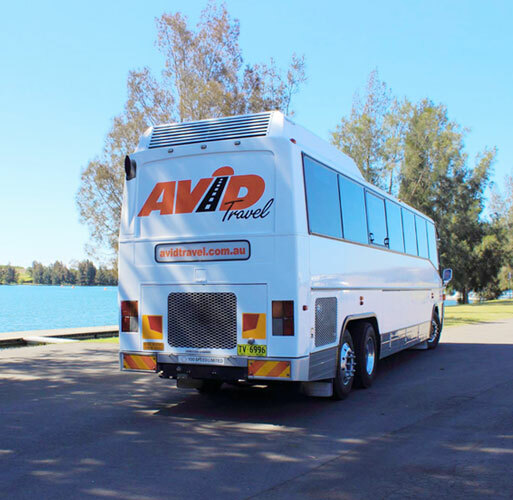 Avid Travel operates coaches from Western Sydney, Coffs Harbour and Central Coast NSW bases. With representatives in all three areas, we can provide you with the personal service that keeps us above average. Avid Travel is fully accredited by TfNSW. Vehicle maintenance and reliability is strictly monitored at all times to ensure your safety and peace of mind. Avid Travel drivers are our customer service officers. They are all competent and qualified for public passenger transport positions here at Avid Travel. Avid Travel has been built over time from experience and a passion for our employment. Our enthusiasm has bought about a small business that has big plans of growth, employment and stability in a volatile, yet versatile field of transport and tourism. A reservation is not confirmed until payment/deposit is received. Seats without a payment will not be held. A non-refundable deposit to the value of 50% of the ticket price is required at the time of booking or full payment required if less than 28 days prior to departure. Balance of payment is required one month prior to departure date or at the time of booking if less than one month prior to departure date. Payment can be made by credit card, EFT or as per the instructions on your invoice. Group Bookings require a $500 deposit at the time of booking. This deposit is non-refundable in the case of client cancelation within 1 month prior to the booked travel date. Cancelation within 2 calendar months prior to travel date incurs a fee of $250. Group bookings are priced on the basis of minimum paid passenger numbers. It is the group organiser's responsibility to ensure that minimum paid passenger numbers are met to maintain the quoted price. In the case of the minimum numbers not being met, the group can pay for the extra seats at a cost of $45/seat plus any incurred supplier costs for the tour. In most cases it is better to transfer the travel date to a date within 3 months of the original booked travel date. A group organiser can arrange for a re-quote for the tour if they wish. In the case of a client cancelation, the booking deposit is non refundable within one month prior to departure date. Group cancelations 1 month or less prior to the travel date are non-refundable, however the booking deposit can be transferred to a later travel date within 3 months of the original travel date. Any incurred costs paid on behalf a group booking that is canceled are 100% non-refundable/non-transferrable. Avid Travel reserves the right to cancel any publicly sold tours which do not have the minimum required bookings to operate any particular tour. In this case, all payments will be refunded in full or transferred to alternative travel. Alterations to itineraries may be required occasionally. This will be in the best interests of all parties concerned and Avid Travel reserves the right to be able to make the required alterations without notice. Terms and Conditions relating to Extended Tours, Holidays and private charter may differ. These will be discussed with our clients at the time of your enquiry. For full terms and conditions of sales, please email our office staff.